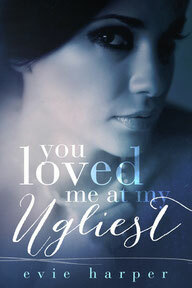 Evie Harper penned a gripping story when she wrote, You Loved Me At My Ugliest, concentrating on the story of Lexi and Joey. When reading this story, I had not realized it was the third part of a trilogy so I'll be going back to read the other two books so I can get the full story, though this book certainly stands on its own two feet. When reading a story, as in real life, I try to put myself in another person's shoes when a given situation comes along. I try to think about what could be happening in a person's life which makes them act, and speak, in certain ways, instead of taking their words and actions personally. I imagine pain they may be feeling which helps me not to cast judgment in the heat of the moment. The story is more than one of abuse and it does involve a world of organized crime, yet the heart of the story is one of pure, unadulterated love which began by two children holding hands, on two separate sides of a fence. Stripped from having a relationship with his mother, holding Lexi's hand after recovering from his beatings was the only thing that Joey could look forward to, and it was the only action Lexi could take which brought any consolation to her mind. Years pass and they grow up, even move in together for a while, but Joey chooses a lifestyle over Lexi and two part ways, moving on with their individual plans and agendas - until Lexi receives word that no one has heard from Joey for a considerable period of time. Leaving everything behind, she's determined to find out if Joey is missing or, worse, dead and will learn the answers even if she puts herself in danger. You Loved Me At My Ugliest is an emotionally raw story which enabled me to finish the last page, having been reassured that even children growing up in the worst possible circumstances have a source of hope, can find their silver lining, their pot of gold at the end of the rainbow. If you would like to read this title or even to read the reviews, feel free to visit its page on Amazon.